Agatha Christie’s publishers were always demanding more Poirot, so for respite, over more than 50 years, she retreated into the world of her favourite married couple, writing fresh adventures for Tommy and Tuppence. Dedicated by Christie, “to all those who lead monotonous lives in the hope that they may experience at second hand the delights and dangers of adventure,” Tommy and Tuppence are coming to BBC1 over six episodes. 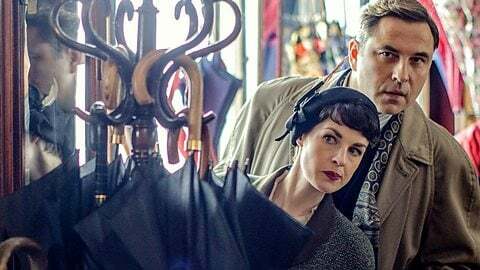 Commissioned to celebrate what would have been Christie’s 125th birthday, Partners in Crime starts at 9pm tonight, starring David Walliams and Jessica Raine. Here’s the trailer. Although Christie began writing the novels in 1922, the TV series begins with them already married in the 1950s. A house in Kingston’s Oak Hill Crescent plays the family home where the couple is tiring of the hum drum life, and, seeking adventure, gets tangled up in preventing international espionage. London’s period locations were put to work last autumn as the backdrop to the couple’s adventures, with the help of many council film offices managed by FilmFixer. One of the most thrilling sequences was filmed in Croydon’s Stanley Halls. A gun goes off and Tuppence knocks the assailant over the balcony, who then falls to her death. The action continues behind the stage curtains, where a bomb is found among props, costume rails and set dressing before finally being defused. Viewers will also spot New Oxford Street, Serle St, Carey Street, and a restaurant on Grey’s Inn Road in Camden; Tower Bridge Court in Southwark; Rectory Grove in Lambeth; and St John Street and a pub on Clerkenwell Close in Islington. “Period filming can disturb Londoners if it’s not handled sensitively,” explains FilmFixer director Karen Everett. “Controlling traffic, moving parked cars, and making sure the shot remains free of all modern intrusion needs to be done at the right time and with resident consultation. “Partners in Crime showcases a wide range of London’s brilliant period areas, and it was all handled with the support of residents.